Get to know the 'real Bali' by heading inland to Ubud. Set amid cool mountains and spectacular terraced rice paddies this seductive town is Bali's cultural hub and spiritual capital. The flourishing arts and crafts scene dates back to the 1930 when eminent European painters, writers and musicians were drawn here and, with engaging panoramas of vibrant rice fields, ancient temples, verdant forests and river gorges, it's easy to see why. Located in the cool mountains and set on the dramatic Ayung River, this traditional country town is just one hour's drive north of the airport and Bali's southern resorts but the pace of life couldn't be more different. Visitors are lured from all around the world to its ceremonial processions and festivals, art galleries, craft workshops, enchanting dance performances, luxurious spas, divine restaurants and incredible scenery. The Ubud area essentially encompasses several outlying villages, each with their own distinctive character and fame for a particular area of the arts, but in tourist terms, Ubud generally refers to the central town area, which is easily explored on foot. Take time to stroll around the numerous galleries, museums, workshops or craft markets around Jalan Raya Ubud and Monkey Forest Road. Temple festivals and ceremonies are almost daily occurrences so you may well chance upon one, but for those not lucky enough to view an authentic ceremony, traditional Balinese dances are performed nightly at nearby Bona village. 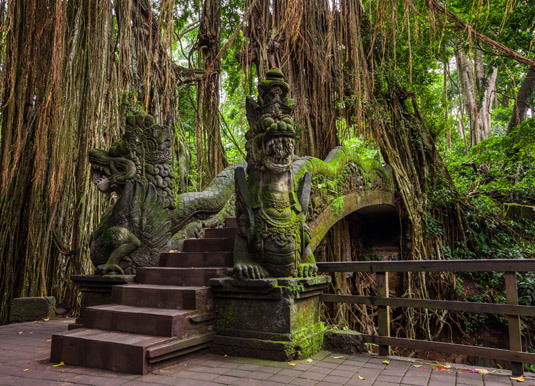 The sacred Monkey Forest nature reserve and temple complex is another popular visitor attraction. 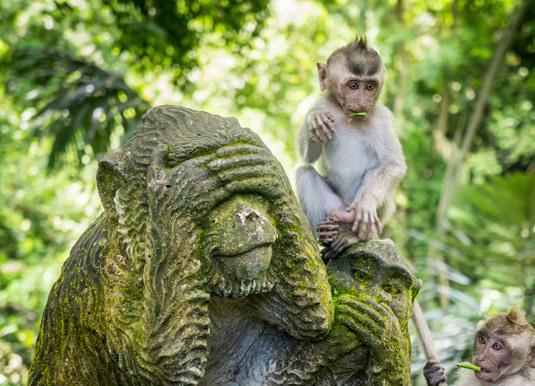 While the lush towering forest features an inspiring Hindu temple, as the name suggests it is also home to hundreds of cheeky long-tailed macaques who, locals believe, protect the area from evil spirits. Ubud is also highly regarded as a centre of well-being with spas, yoga and meditation all on offer, or should you feel creative why not visit a Balinese cooking class. Dining out in Ubud is a real pleasure too, thanks to the town's superb dining scene. There is no shortage of choice with over 300 restaurants, varying from fine dining venues to local delicacies at bustling market stalls. Monkey Forest Road and Ubud High Street is viturally wall to wall eateries with elegant open-air restaurants and European-style cafes. 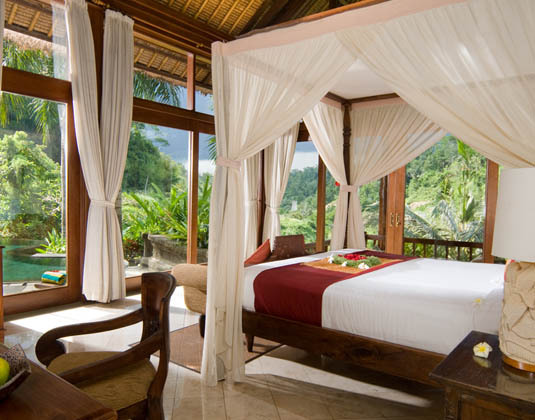 We highly recommend spending a few nights in Bali's cultural heart for an authentic taste of the islands' traditions. 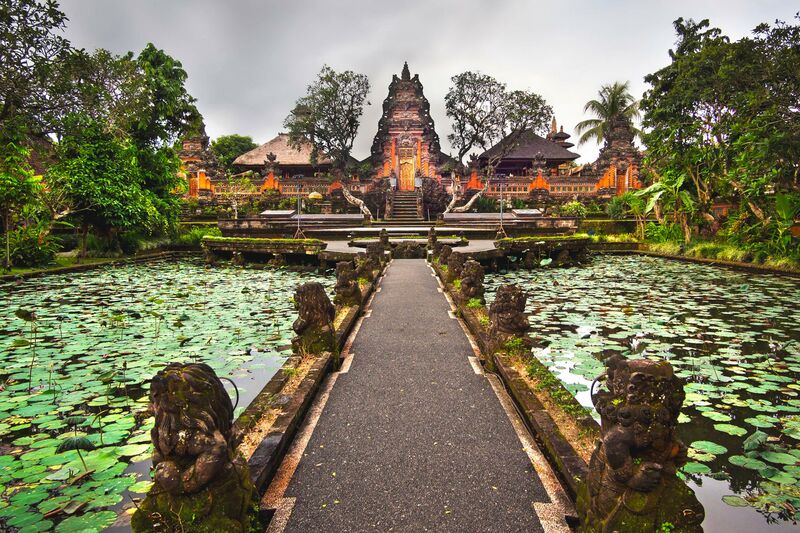 Call and speak to one of our travel experts who have experienced Ubud personally. 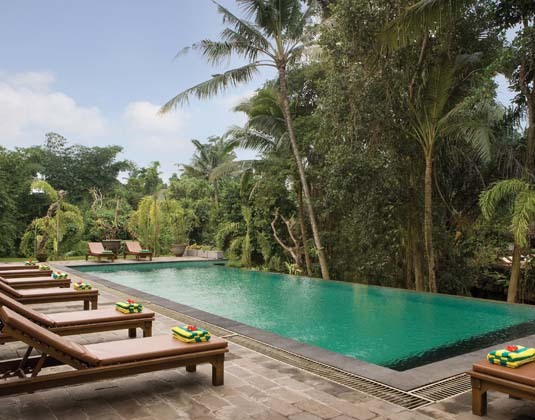 From Denpasar airport or beach resorts, the transfer time by road to Ubud is approximately 1 hour. While July to October is considered the best time, there is never a bad time to travel to Bali, as it’s generally warm throughout the year. Although more rain tends to fall from November to June, it’s usually a short, tropical downpour.